Both Laura Muir (coach: Andy Young; club: Dundee Hawkhill) and the 4x100m relay teams delivered glorious golds as the European Championships drew to a close, with Eilish McColgan (Liz McColgan; Dundee Hawkhill) also taking a magnificent silver, as Great Britain & Northern Ireland finished with a total of 18 medals, including seven titles, to top the Berlin medal table. For Muir a first major outdoor title and the first European 1500m title ever won by a British female was in the script, however that wasn’t to say it would always go to plan for the race favourite on the night in a field that contained dangerous finishers. After a cautious opening 300m which saw the field go through in 53, Muir and Weightman went straight to the fore and ensured the race was honest from that point in, with 700m being reached in around 2:07 as Muir took every opportunity to increase the lead she held. From that point on it seemed it was Muir’s gold to lose, with Weightman also a constant threat to the medals as she kept in second around five metres or so behind. outdoor title – in 4:02.32. Behind Muir, and after showing signs of fighting the lactic at the bell, Weightman ran a gritty and determined final 400m to hold off the charging Ciara Mageean (IRL) and secure a magnificent bronze to match her effort from Zurich in 2014, her time being 4:03.75 as Sofia Ennaoui (POL) took silver. “I wanted to make it a true 1500m race, not an 800m race. That’s why I took it on further out; I just had to trust my pacing to judge it right, but I did and I’m really happy,” said Muir of her tactics and the title they brought. 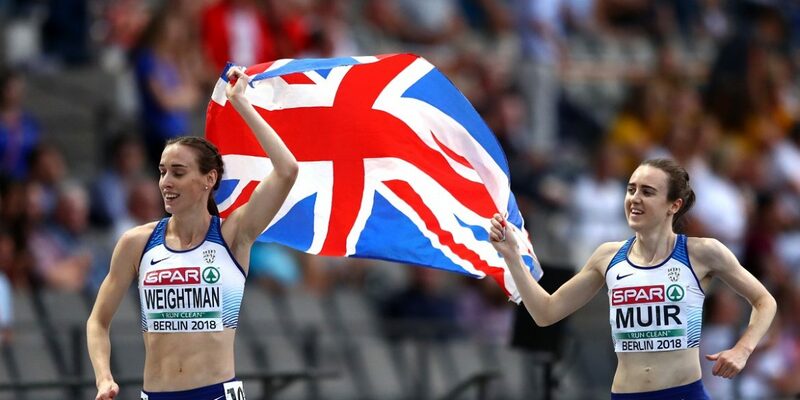 On her bronze-winning run, Weightman commented: “It’s been a bronze year for me – I think to step away from the Commonwealth Games 5000m and the 1500m here at the European Championships; I’m incredibly proud of what I’ve achieved this year. The first of the two sprint relays taking place as the Championships drew to a close, the British women’s 4x100m quartet went one better than the silver won in Amsterdam two years ago as a storming anchor leg from Dina Asher-Smith (John Blackie; Blackheath & Bromley) brought home the title and saw the 22-year-old claim her third gold of the championships – something no Brit has ever achieved. Led out in the safe hands of expert starter Asha Philip (Steve Fudge; Newham & Essex Beagles), the baton changed hands safely from her to training partner Imani-Lara Lansiquot (Fudge, Sutton & District). Making third leg her own at these championships, Bianca Williams Williams (Lloyd Cowan, Enfield & Haringey) carried the team well, though when the baton reached Asher-Smith the team had ground to make and sat in fourth. Asher-Smith took on the challenge and delivered emphatically, getting into her running to drive past the opposition standing between Britain and gold – Germany, Netherlands and Switzerland – and secure gold in a world-leading 41.88. Speaking on the team’s determination to win this title this time around, lead-off leg Philip said: “We came second last time, and I said, we’re not going to do that again. We are Olympic medallists, we are World Championship medallists and I feel like we needed to prove ourselves in Europe. Having made history of her own with an unprecedented three golds in one European championships, Asher-Smith said: “It has been a very good week’s work. I came and won everything that I entered and I am very, very happy. Obviously these girls ran such fantastic legs so respect to them and it was almost a national record. I couldn’t have done it without each of these women’s hard work. Earlier in the evening the quartet of Philip, Lansiquot, Williams and Daryll Neita (Jonas Dodoo; Shaftesbury Barnet) had swept round safely to take victory in a swift European leading time of 42.19 from lane two, with safe changes indicating that the team had the potential to go much quicker later in the evening. Seeking to defend their title, the men’s line-up of CJ Ujah (Stuart McMillan; Enfield & Haringey), Zharnel Hughes (Glen Mills; Shaftesbury Barnet), Adam Gemili (Rana Reider; Blackheath & Bromley) and Harry Aikines-Aryeetey (Benke Blomkvist; Sutton & District) delivered the goods once again to make it three European 4x100m titles in a row. Led out strongly by Ujah, the newly crowned European 100m champion Hughes then dropped an unstoppable leg on the back straight to open the team’s lead before handing over to Gemili on course for gold. Hugging the bend and extending the lead, a final changeover to Aikines-Aryeetey saw him take charge and deliver what was needed, with a dip securing victory and gold with a time of 37.80 by some margin ahead of national records from Turkey (silver) and Netherlands (bronze). Now the European 100m and 4x100m champion, Hughes commented: “It’s been a real exciting year for me with the European Championship, I’m really happy to be with these guys today and I was really happy to get a gold medal with them. Having now played a part in Britain’s three consecutive European 4x100m golds, Gemili said: “It’s a nice way to end the championships and it’s a cool wat that we got to do it as well, as its usually the 4x400m guys but a gold medal is always sweet. After stepping in to take up the role of anchor following a slight injury to Nethaneel Mitchell-Blake (Denis Shaver; Newham & Essex Beagles) in the heats, Aikines-Aryeetey said: “Unfortunately Nethaneel couldn’t partake in the final, so we had to make some smart decisions taking care of his body. I’m the old dog, I got my first (senior) international medal here nine years ago. The quartet of Ujah, Hughes, Gemili and Mitchell-Blake had followed the female team’s lead by coasting through qualification with an impressive 37.84 for victory, with a niggle sustained during the heat seeing Mitchell-Blake replaced by Aikines-Aryeetey on anchor come the final. In fellow endurance action shortly after the women’s 1500m had concluded, McColgan was rewarded for her bold tactics and a wisely-run race as she clinched a magnificent silver in the final of the women’s 5000m. Taking the race on from the gun, McColgan did much of the early running at the front of the field and was unfazed by Yasemin Can (TUR) coming past her and looking to push the pace on at half-way, with the both she and compatriot Melissa Courtney (Rob Denmark; Poole AC) sticking to their own race to tick along in fourth and sixth respectively. Come the bell an all-together confusing episode saw Lonah Chemtai Salpeter (ISR) wheel off in celebration having thought she had secured silver, with McColgan then taking advantage to move from bronze into silver and kick on from those looking to chase her down. Holding on down the back straight and into the home, McColgan crossed the line arms aloft in 14:53.05, the third quickest of her career. She said: “I’m so happy – I can’t explain how happy I am. My mum said to be ‘you know you’re in PB shape, you know you are, run the way that’s best for you’. Haring down the home straight in pursuit of the highest placing possible, compatriot Courtney was rewarded for a well-judged race with a personal best time of 15:04.75 for fifth – a 12-second improvement on her previous best – as she continues to progress within the event, while Steph Twell’s (Geoff Wightman; Aldershot, Farnham & District) 15:41.10 saw her place tenth having attempted to keep with the lead pack throughout. In the field, and seeing him vault in his first senior final in a British vest, Adam Hague (Trevor Fox; Sheffield & Dearne) entered the final of the men’s pole vault in high spirits following an outdoor personal best clearance of 5.61m during the qualifying rounds. Maintaining a clean score-card early on thanks to first-time clearances at 5.30m and 5.50m, the next height, 5.65m, saw Hague tasked with an outdoor personal best clearance to continue in the competition. Needing a clutch jump following two failures, Hague cleared the height with a little room to spare to better his outdoor lifetime best by 4cm and staying in reckoning among some world-class vaulters. Though three consecutive failures at 4.70m saw him bow out, a tenth place finish and two consecutive bests will see the championships classed as a very successful one for the 20-year-old. Competing in what was his fourth European Championships having debuted back in 2006, Nathan Douglas (Aston Moore, Oxford City) aimed for the podium. Opening up with a season’s best of 16.71m (+0.2), Douglas laid a marker for the rest of the field to chase on, with five athletes going on to surpass the mark leaving him to chase the medals. Jumping to 16.69m (-0.3) and 16.59m (-0.1) before in matching his first-round jump in round six, Douglas’ best mark left him an agonising 7cm down on bronze and settling for sixth. The women’s 3000m steeplechase saw Rosie Clarke (David Harmer; Epsom & Ewell) debut in her first major final. Tucked within the second pack and flitting between seventh and 11th over the course of the race, Clarke fell just short of a top- eight finish as the leaders pushed the pace on throughout. Finishing in 9:32.15, Clarke’s time saw her miss her personal best by just 0.08 and finish in a respectable tenth place in her first ever European Championships final. In throws action, and looking to better her fourth-place finish from 2016’s championships in Amsterdam, Sophie Hitchon’s (Tore Gustaffson; Blackburn Harriers) hammer throw campaign started with a steady 68.80m in round one, with a foul throw in excess of 70m then left her sweating on a strong third throw in order to stay in the competition. Pulling out 70.52m and in the cut for the final eight, Hitchon left it all to do in round six following consecutive fouls, with another non-mark in the final round seeing the aforementioned mark sit as her best and leave her in eighth place in the standings. 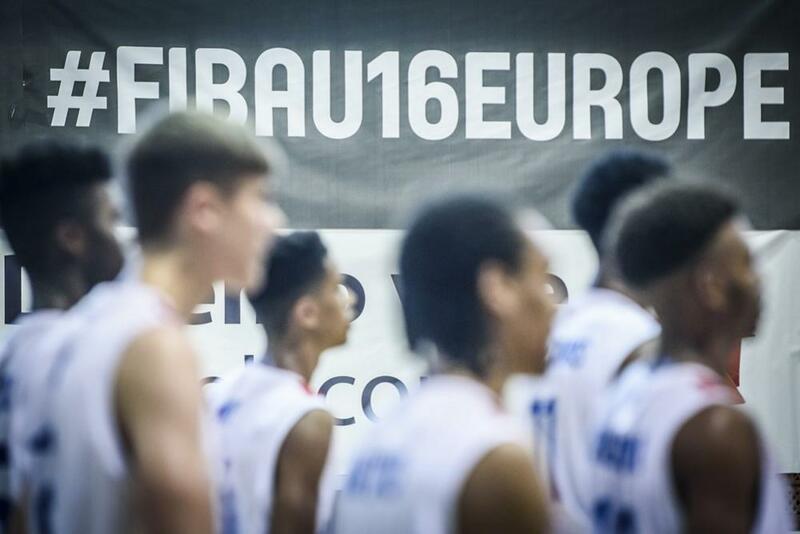 Great Britain enjoyed a comfortable 89-37 victory over Luxembourg, at the FIBA U16 European Championship Division B in Sarajevo. Five players produced double-digit scoring performances, led by Sam Grant who finished with 21 points and eight rebounds. Head Coach James Vear made one change to the starting lineup, with Manchester Giants small forward Victor Faroukou coming in for Segun Shodunke. GB dominated from the word go, with energy, good execution and no little size advantage. Despite Friday’s defeat to Romania, they played with confidence and freedom to lead 27-9 after the first. 6’8 Northampton power forward Grant produced his best game of the tournament with the Northamptonshire Titan gaining points as well as providing energy off the glass. Once again, points were shared around the team, with Eze and Marsh producing similar first half displays, GB with a 43-22 margin to their favour. Against a team conceding 171 points in their opening two games, GB’s third quarter began in a less than assured fashion with Luxembourg keeping margins much tighter. But when Josh Uduje found the three to make it 52-27 with 6:37 remaining in the third, GB rediscovered their offensive bite putting on a 12-3 run to end the quarter, 64-30 in front. GB then turned the screw and allowed no mercy in the final quarter, producing a 27-9 quarter to win it 89-37. After Grant led all scorers, Amari Williams contributed 13 points, eight rebounds, seven assists & two steals, while 12 each came from Faroukou, Uduje and Marsh who all had good numbers in rebounding (seven, six and five respectively. Full stats are available. They now have Monday’s next Group A game against Portugal (2000 BST), with both GB and Portugal taking a 2-1 record behind Group leaders Romania, going into their meeting.